Introduction: As the cheapest and lightest of Pontiac’s fullsize coupes and convertibles, the Catalina was the car of choice for fullsize performance enthusiasts. From light-weight body panels to Super Duty engines and other modifications, the Pontiac Catalina would firmly establish Pontiac’s performance image. Comments: Pontiac downsized its midrange Catalina and Ventura for 1961. Wheelbase dropped from 122 inches to 119, and overall length decreased by four inches. The result was a 200 pound weight loss which helped performance. Pontiac had introduced its new 389 cid V8 in 1959, and it would remain Pontiac’s signature engine through the 1960s. The 389 V8 came in several forms: with a single two barrel carb, it was rated at up to 267 bhp. With a single four barrel, it was rated at up to 333 bhp and with three two barrel carbs (Tri Power), it was rated at 348 bhp. There were even special “Super Duty” versions which increased its power to 363 bhp. Late in the model year, Pontiac even applied 389 Super Duty hardware to about a dozen 421 cid V8s intended for drag strip duty. Furthermore, Pontiac offered a wide range of performance modifications including aluminum front bumpers, radiators, and body parts. A Borg Warner four-speed manual was now a production item, as well as a dealer installed Hurst three-speed manual. Engines: 389 (2 bbl) V8 267 bhp. 389 (4 bbl) V8 333 bhp. 389 (3×2 bbl) V8 348 bhp @ 4800 rpm, 430 lb-ft @ 3200 rpm. SD 389 363 bhp. Performance: 389/348: 0-60 in 8.2 seconds 1/4 mile in 15.5 seconds @ 93 mph. Comments: Pontiac expanded the availability of its Super Duty modifications in order to meet new NHRA rules changes which required engines and body parts for the stock classes to be production options on retail vehicles. Therefore, the very limited Super Duty 421 was officially listed as an expensive, limited option on fullsize Pontiacs. 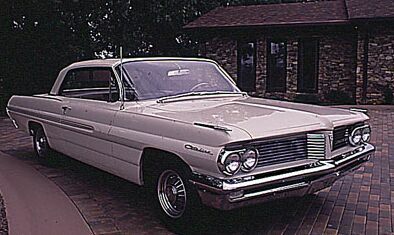 Fewer than 180 were built for 1962, with the majority installed in Catalinas, although about 16 were installed in Pontiac’s new personal luxury coupe, the Grand Prix. The 1962 Super Duty 421 was officially rated at 405 bhp, but true output was rumored to be around 460 bhp. Although street legal, these engines were truly race ready with four-bolt mains, forged rods and crank, solid lifters, and NASCAR heads. Stock car racing versions used a single four barrel carb but street versions had twin Carter 500 cfm four barrel carbs and an aluminum intake manifold. Super Duty Catalinas also had free-flow cast iron headers with easily removable exhaust dumps that could be unbolted for even more power. Only three and four-speed manuals were offered; Pontiac’s automatic couldn’t handle the power. Other Super Duty options included aluminum front-end body clip and a weight-cutting modified frame. These modifications saved 110 pounds. Pontiac would even fit aluminum exhaust manifolds to save 40 more pounds, but warned that they were only intended for quarter mile competition as they would melt if they were subject to more heat. Engines: 389 (2 bbl) V8 267 bhp. 389 (4 bbl) V8 333 bhp. 389 (3×2 bbl) V8 348 bhp. SD 389 363 bhp. SD 421 405 bhp @ 5600 rpm, 425 lb-ft @ 4400 rpm. Comments: Pontiac fullsize performance reached its peak in 1963. All fullsize models got new sheetmetal for 1963, including stacked headlights. Performance enthusiasts once again turned to the Catalina, the lightest of the Pontiac fullsize coupes. The standard engine was a 389 cid V8 with 283 bhp. Next up were two 421s with 10.75:1 compression ratios: a four barrel with 353 bhp and the Trophy 421 HO (High Output) which sported triple Rochester two-barrel carburetors operated by a progressive throttle linkage and was rated at 370 bhp. For serious drag strip use, buyers could specify the Super Duty 421 which came in three states of tune which all benefited from an increase in the compression ratio from 11.0:1 to 12.0:1 and an increase in the maximum shift point from 5900 rpm to a screaming 6400 rpm. The mildest Super Duty 421, designed for high speed use, used a single four barrel carb and was rated at 390 bhp. Next up was the drag strip version which used a dual four barrel and was again underrated at 405 bhp. This engine came with aluminum exhaust manifolds standard and steel manifolds optional. At the top was a second drag strip version with a dual four barrel carb version and a 13.0:1 compression ratio which Pontiac timidly rated at 410 bhp. Only 88 of these engines were built for all models, and those Catalinas so powered could turn sub 14 second quarter miles. But eager for more performance, Pontiac offered a limited number of Super Stock lightweight Catalinas with the famous “Swiss Cheese” frames (which had grapefruit sized holes drilled into the chassis rails), aluminum axle centers, aluminum front panels and front and rear bumpers, plus numerous other modifications. The net result was a 300 lb weight loss over regular Catalinas, allowing quarter mile times in the low 12s at more than 116 mph. Unfortunately, all of this performance was too much for General Motors and GM instituted a complete ban on competition activity, forcing Pontiac to stop installing all Super Duty components. Engines: 389 V8 289 bhp. 421 HO V8 370 bhp. SD 421 390 bhp. SD 421 405 bhp. SD 421 410 bhp. Performance: SD 421/410: 0-60 in 5.2 seconds, 1/4 mile in 13.7 seconds @ 107 mph. Super Stock lightweight SD 421/410: 1/4 mile in low 12s at more than 116 mph. 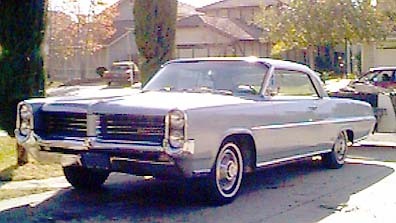 Comments: The Catalina underwent a mild restyling for 1964 and Pontiac officially created a new model, the Catalina 2+2, to carry the performance banner for fullsize Pontiacs. Out of 257,768 Catalinas produced in 1964, only 7,998 (3%) carried the 2+2 option. The standard engine in the 2+2 was a 389 cid 283 bhp V8. The elimination of the previous year’s Super Duty engines and modifications left performance enthusiasts with three 421 cid V8s available, rated at 320, 350, and 370 bhp. Engines: 389 V8 283 bhp @ 4400 rpm, 418 ft-lb @ 2800 rpm. 421 V8 320 bhp @ 4400 rpm, 455 ft-lb @ 2800 rpm. 421 V8 350 bhp @ 4400 rpm, 454 ft-lb @ 3200 rpm. 421 V8 370 bhp @ 5200 rpm, 460 ft-lb @ 3800 rpm. 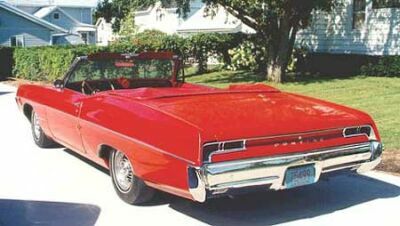 Comments: Catalina 2+2 sales increased 44% for 1965 as the model sported a new body riding on a new, slightly longer chassis, with a 121 inch wheelbase. The 2+2 standard engine was now the 421 V8 with a single four barrel carb rated at 338 bhp. Two other 421 engines were available, including a Tri-Power (3×2 bbl) version producing 356 bhp and the 421 HO rated at 376 bhp. Standard features of the 2+2 included heavy-duty springs and shock absorbers, a three-speed transmission with a Hurst shifter, dual exhausts, and a performance axle ratio. There were also special interior and exterior trim treatments, including bucket seats, seat belts, full carpeting, custom pinstriping, and vertical louvers on the front fenders, all standard. A new Turbo Hydramatic automatic transmission replaced the old Hydra-matic and improved performance. Car and Driver tested a Catalina 2+2 and recorded a top speed of over 130 mph and a 0-60 time of just 3.9 seconds. Engines: 421 V8 338 bhp @ 4600 rpm, 459 ft-lb @ 2800 rpm. 421 V8 356 bhp @ 4800 rpm, 459 ft-lb @ 3200 rpm. 421 V8 376 bhp @ 5000 rpm, 461 ft-lb @ 3600 rpm. Comments: Although still based on the Catalina, the 2+2 became its own unique model for 1966. The few changes included a revised bucket seat design and a new two-stage muffler/resonator type exhaust system. Standard equipment included low-restriction exhausts, chromed air cleaner and valve covers, heavy-duty suspension, carpeting, and bucket seats. Headrests, superlift air shocks, and a transistorized ignition were optional. 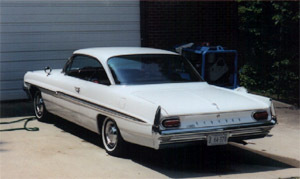 External identification included twin lens taillamps, 2+2 badges on the deck lid and rear fenders, vertical air slots behind the doors and “Pontiac 421” plaques on the front fenders. The three 421 engines were carried over. Comments: After just one year, the 2+2 reverted back to an option package on the Catalina. A new 428 cid V8 with 360 bhp was the standard engine, while performance fans could choose the new Quadra-Power 428 V8 with 376 bhp. There was also a slight restyling which included disappearing windshield wipers. Despite these changes, sales were down dramatically for 1967. This would be the last year for the 2+2 option on the Catalina, although the 428 V8 would still be available on regular Catalinas. Engines: 428 V8 360 bhp @ 4600 rpm, 472 ft-lb @ 3200 rpm. 428 V8 376 bhp @ 5100 rpm, 462 ft-lb @ 3400 rpm.